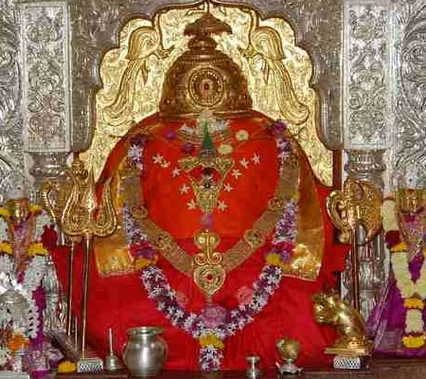 The Ranjangaon Ganpati temple or well know as Mahaganpati of Ranjangaon is located in Shirur Taluka about 51.5 km (via Pune - Ahmednagar Highway - in 1 hr 31 min) from Pune. This is the eighth temple visited by devotees who set out on the divine Ashtavinayak tour/Darshan. 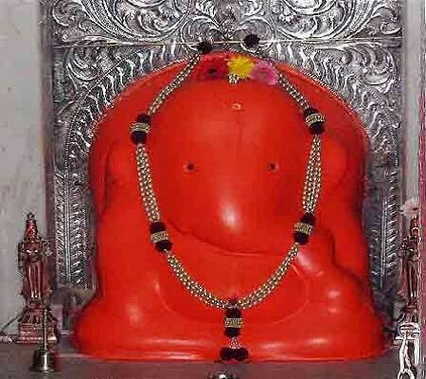 The idol at Ranjangaon is of Mahaganpati, the most powerful representation of Lord Ganesha. In the events or Ganesh Jayati days, lots of small shops here for shopping and the sweet Prashad (Pedha) of Lord Ganesha. Managanpati is portrayed, seated on a lotus, flanked by his consorts Siddhi (spiritual power) and Riddhi (prosperity). The idol of Lord Ganesha is also named as 'Mahotkat', and it is said that the idol has 10 trunks and 20 hands. Mahaganpati is depicted as having eight, ten or twelve arms. It is after invoking this form of Ganpati that Shiva vanquished the demon Tripurasur and so he is also known as Tripurarivade Mahaganpati. It is believed that the place where Lord Shiva invoked Lord Ganesha and defeated Tripurasura is Ranjangaon (the word Ranjan means the delighted one), prior to which it had the name of Manipur. The temple new main gate is the amazing and nice view from the highway. At the time of Ganesh Jayanti, the temple decorated with flowers and lightinings of small lights. Millions of peoples are visiting here for Ganesh Darshan in Ganesh Jayanti and trust proving meal for everyone in this days. In the temple, the Gods painting very nice, much see. 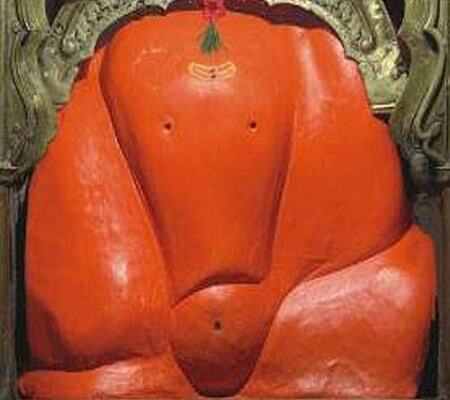 Ranjangaon Ganpati is one among the Ashtavinayak, commanding eight occasions of legends identified with Ganesha. This present temple's Ganpati idol was initiated and given by the "Khollam" family, a goldsmith family situated in Ranjangaon. The temple was worked between the ninth and tenth century. The principle temple appears as though it was worked in the Peshwa time frame. Nagarkhana is arranged over the passage door. The temple confronting east has a tremendous and wonderful passage entryway. 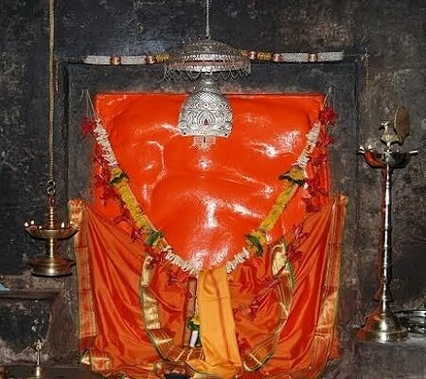 Madhavrao Peshwa made a room in the storm cellar of the temple to keep the idol of Lord Ganesh. Later on, Sardar Kibe of Indore redesigned it. The idol of these master Ganesh is additionally named as 'Mahotkat', and it is said that the idol has 10 trunks and 20 hands. In Ranjangaon, villagers don't get Ganesh idol their homes, rather, everyone goes to the temple for Ganesh pooja, in the period of Bhadrapada. There is an uncommon sixth-day celebration in the period of Bhadrapad, amid which Mahabhog is offered to the temple divinity on the fifth day. Amid this celebration, the temple god is additionally taken around the territory in a blossom be-decked palkhi (palanquin). Expansive groups accumulate amid this celebration to likewise observe the wrestling matches which are uniquely composed as of now. On the 6th day, devotees take darshan of murti and then go to Mahaganpati's temple by performing Lotangan (surrender) in transit. (lotangan implies continuing by moving one's self over and over). As indicated by the history the temple was worked in the middle of the ninth and tenth century. Temple has so built that sunbeams fall straightforwardly on Shree Ganesha's idol. Since this temple was en route to war, Shreemant Madhavrao Peshwa used to end here have Mahaganpati's darshan. Madhavrao Peshwa made a room in the storm cellar of the temple to keep the idol of Lord Ganesh. He had built a stone sanctum around this swayambhu or self-radiated idol. In 1790 A.D he gave a genetic appropriate to perform pooja of Mahaganpati to Shri Anyaba Dev. Temple Hall was worked by Sardar Kibe and Owaris (a few little flats raised along the course of encasing mass of the temple) were worked by Sardar Pawar and Shinde. Celebrated recluse Morya Gosavi had exhibited an idol made of five metals to Shri Anyaba Dev. This idol is taken out in the parade on happy days. Nagarkhana is arranged over the passage door. This Nagarkhana was introduced by Maharashtra's decent Chief Minister Shri Manohar Joshi on third May 1997. The primary temple resembles the temple from Peshwa's period. Temple confronting east has tremendous & lovely passageway entryway. Regular buses from Pune Station and Shivaji Nagar are available. While going from the Pune – Nagar highway the route is Pune – Koregaon – then via Shikrapur. Rajangaon is 21.2 km before Shirur. From Pune, Ranjangaon is 51.4 km. The nearest Railway station to ranjangaon Ganpati is Yevat which is located in and around 29.4 km distance. Hadapsar Airport is the nearest airport which is at 43.4 km from Ranjangaon. Ranjangaon to Lenyadri Distance: 2 hr 3 min (73.6 km) via Narayangaon - Junnar Road. Fastest route. The usual traffic. Ranjangaon to Ozar Distance: 1 hr 52 min (65.3 km) via Narayangaon - Ozar Road. Fastest route. The usual traffic. Ranjangaon to Theur Distance: 1 hr 3 min (41.5 km) via Aurangabad - Ahmednagar - Pune Highway/Beed - Ahmednagar - Pune Road/Kopargaon - Shirdi - Ahmednagar - Pune Highway/Parner - Pune Highway/Pune - Ahmednagar Highway. Fastest route. The usual traffic. This route has tolls. Ranjangaon to Siddhatek Distance: 2 hr 11 min (80.4 km) via Shrigonda Nhavare Road. Fastest route. Ranjangaon to Morgaon Distance: 1 hr 40 min (69.9 km) via Shirur - Satara Road. Fastest route. lighter traffic than usual. Ranjangaon to Pali Distance: 3 hr 44 min (160 km) via Bengaluru - Mumbai Highway/Mumbai Highway/Mumbai - Pune Highway/Mumbai - Pune Expreeway. Fastest route, the usual traffic. This route has tolls. Ranjangaon to Mahad Distance: 2 h 42 min (125 km) via Bengaluru - Mumbai Highway/Mumbai Highway/Mumbai - Pune Highway/Mumbai - Pune Expreeway. Fastest route, the usual traffic This route has tolls.